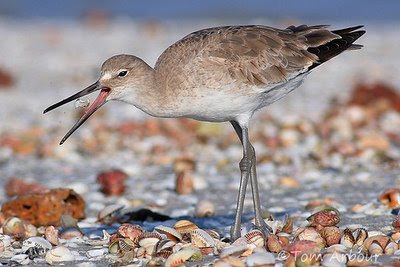 Willet, Sanibel Island, March 2008. Awesome Shot . . . which lens did you use for this shot? Thanks Anna- the birds were feasting on all the creatures washed up by a storm the day before. That's a neat shot, Tom. I went to your other blog to see what it was tossed up and still not sure but it makes an excellent photo. Thanks Abe- I'm really not sure either. Maybe by this point, it had already gotten the meat out of the creature, and was actually expelling the shell? Who knows.